Over the last four and half years, Raspberry Pi has sold 10 million credit card-sized computers. To celebrate this milestone, the company released a Raspberry Pi Starter Kit. 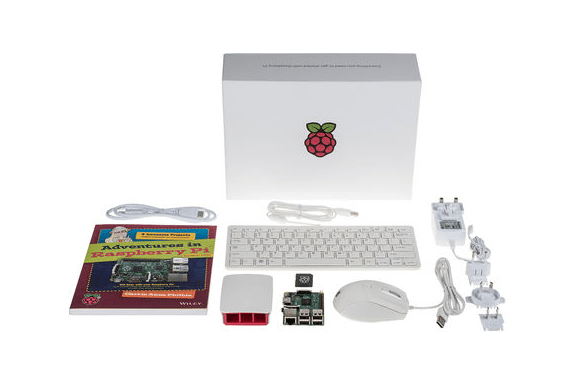 The kit contains a Raspberry Pi 3 Model B, an 8GB NOOBS SD card, an official 2.5A multi-region power supply, an official 1m HDMI cable, an optical mouse and a keyboard with high-quality scissor-switch action, a copy of Adventures in Raspberry Pi Foundation Edition, and an official case. The kit is currently only available in the UK, but will be available worldwide in the next few weeks. Eben Upton, the founder of Raspberry Pi, originally wanted to increase the amount of people studying computer science and hoped to sell about ten thousand units. Ten million sales later, kids are using Raspberry Pi to learn about programming, and many others use it for do-it-yourself projects. A percentage of each Raspberry Pi purchase goes toward several of their educational programs, including educational outreach programs, including Code Club and Picademy. Read more about the starter kit at CNET. See what else we’ve covered about Raspberry Pi in the past!